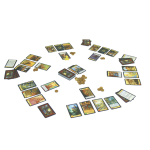 In Citadels, you are a medieval ruler trying to complete your city before your opponents can build theirs. Expand your city by adding new districts, but be sure to invest wisely; some districts are more valuable than others, but cost more gold to build. There is more to ruling a city than gold, however. Lords, ladies and other nobility all have a role to play. The game changes each turn as each player secretly chooses a new role - the Assassin, Thief, Magician, King, Bishop, Merchant, Architect, or Warlord - and the power that comes with it. 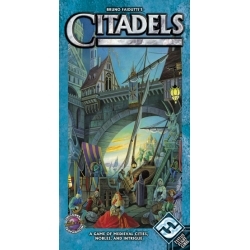 This edition of Citadels includes the Dark City expansion. This exciting addition to the game features 14 new purple district cards and a premium wooden crown marker. Citadels is a card game of bluffing, diplomacy, and city-building for two to eight players, ages 13 and up. 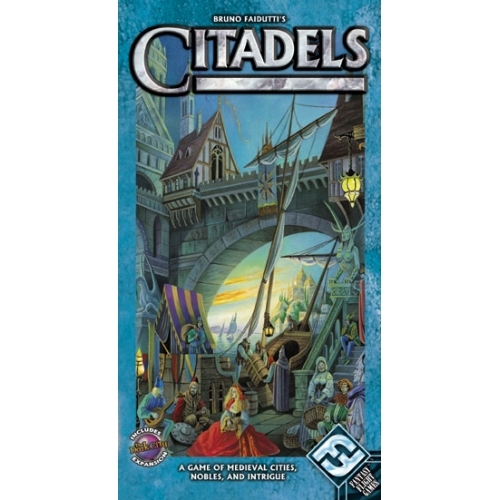 Citadels is playable in 20 to 60 minutes. Ages: 13+ (not suitable for children aged 0-3). 14 Bonus purple district cards!